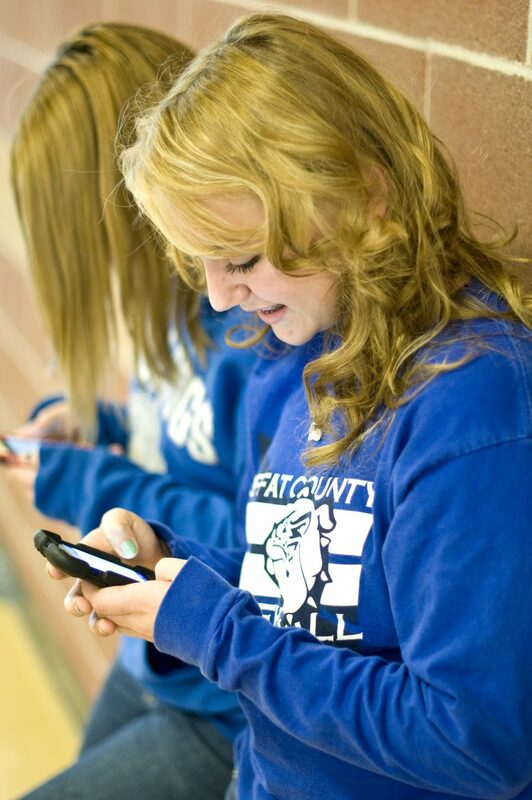 Craig Middle School seventh-grader Alexis Blomquist checks the lunch schedule using the new CMS app on her smartphone. Blomquist and other student leaders are encouraging their friends and parents to download the app. Craig Middle School students will never again have to wonder what’s for lunch. The school recently launched its own app, designed to help parents and students stay in the loop at the touch of a button. Accessible from any smartphone or tablet device — including iPhones, iPads and Androids — the app features a calendar, news, photos and even an absence form, among other things. The app is linked to the school’s website, said CMS Principal Dave Grabowski. Any time information is posted to the school’s calendar or news, it automatically updates the app as well. Users can even opt to receive “push” notifications, which alert them when updates have been made. Available for free in the app store, Grabowski designed the app to help parents stay up to date with CMS happenings without having to rely on Facebook. Grabowski has enlisted student council and enthusiastic students such as seventh-grader Alexis Blomquist to help get the word out. Blomquist set out at the most recent basketball game to get as many of her friends and their parents to download the app as she could. A volleyball player at CMS, she especially loves the photo feature and the lunch menu under the calendar tab. The app also provides access to “Infinite Campus,” a tool accessible from the website which allows parents to access their children’s grades, attendance records, fees and other important information. Another feature on the app allows parents to fill out an absence form for their child that gets sent directly to school staff. Grabowski was quick to assure that someone from the school always calls the parents to confirm, however, minimizing potential abuse of the feature by students. CMS is the first school in the district to launch its own app, although MCHS is currently developing one. Starting with the Parent Advisory Committee meeting Monday, Grabowski said he and student leaders will be making a big push this week to get word out to parents and students. Their goal is to get 100 people to download the app.